There are a couple of new things in the studio I wanted to share. 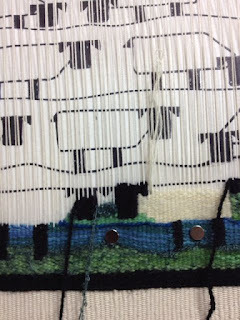 I am certainly getting a lot of learning from my tapestry yarns and breeds sampler. On Tommye Scanlin's blog ( check the link, it is something you should see) I saw that she was experimenting with using magnets to hold her cartoon in place and I decided to give it a try. I ordered some rare earth magnets from Amazon, they are small but mighty and I put them on the sampler to try them out. They are working really well! Not only do they hold the cartoon in place but you can easily move them to just the right spot by placing two magnets one on front and one on back near the edge and as you move the one in front the back one dutifully follows. So convenient ! 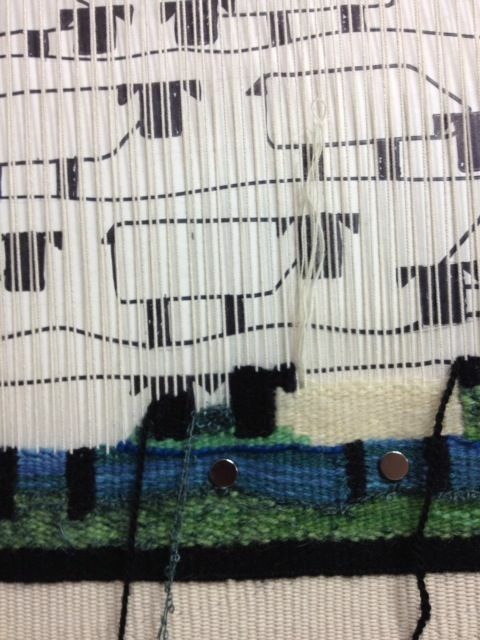 Not only that but if you like to sew slits as you go they can be used to park your needle. 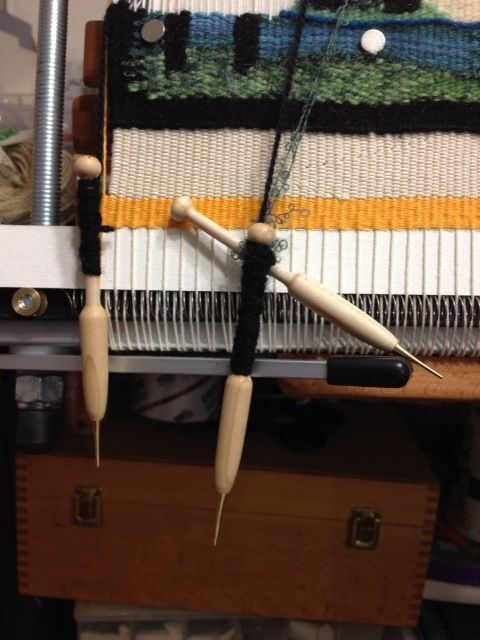 The other great new thing is that my made to order tapestry bobbins from John Moss arrived. They are beautiful and I am in the process of learning more efficient bobbin techniques and I put those in action on the tapestry yarn sampler as well. His link is also on the side. On the news front. Yes!!! It is official. My handspun, hand woven, hand knitted vest is a winner in the Handwoven Magazine Sleeveless garment contest. It has won a prize for best use of handspun yarn and should appear in the September/October issue. Pretty exciting for me. There is an earlier post about the vest. 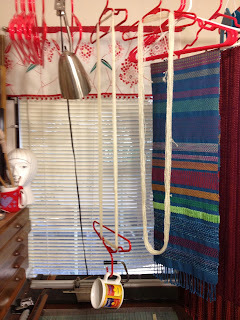 I had a couple of questions about how I finish my singles tapestry yarns so here is a picture that shows a couple of the mini skeins for the sampler ( these are Cotswald) hanging to dry. For the tapestry singles I like to make fairly small skeins (1 to 2 ounces) and after washing I use some weight on the skeins as they are drying. 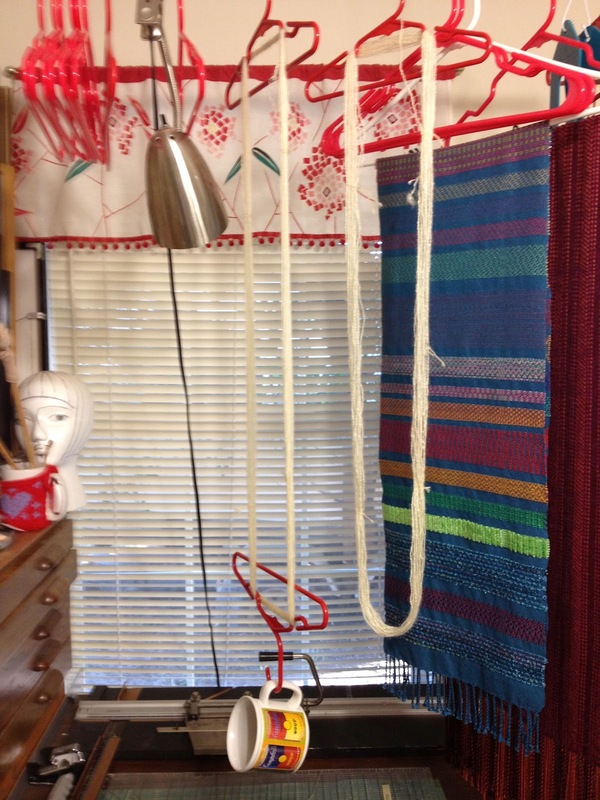 Those are child size hangers which fit the skeins nicely, the plied yarn is the one without the weight. Finally , if you follow the Mirrix news you may know that they recently chose two people to receive free Mirrix Looms in exchange for social networking about their loom adventures. One of the winners is Noreen Crone-Findlay ( see link to the side) who does some beautiful fiber work of all kinds and has a wonderful blog, Tottie Talks Crafts. 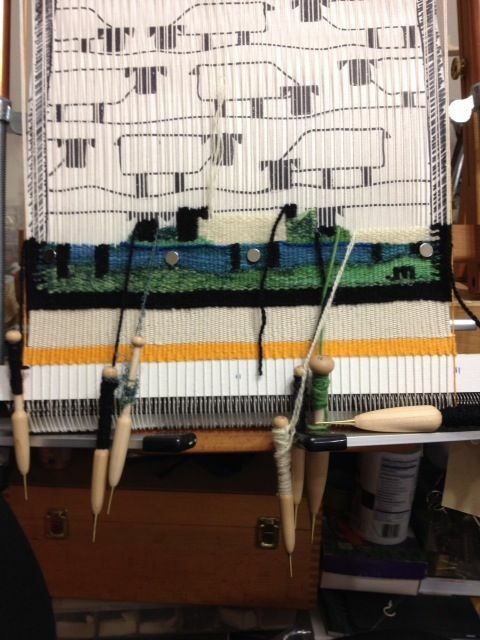 She has already made a video about making heddles for the Mirrix Loom and you may want to check it out. Thank you so much for your kind mention and link! I really appreciate it! 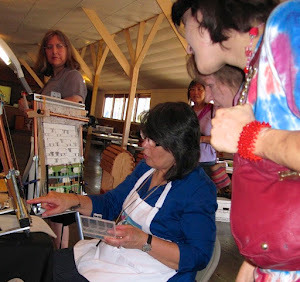 You are most welcome, I think it will be very interesting to follow your journey with the Mirrix looms!